Without development, there won’t be peace; we must develop the economy, I don’t want to just be the liberator, I want to be the leader who brings permanent peace and development to this country and reconciliation with Tamil communities in the North and the East, said President Mahinda Rajapaksa in an interview with the Forbes Magazine. President Rajapaksa spoke of the country’s current economic trends and said even during the war, the economy grew by at least six percent each year. Inflation is now down to 1.1 percent, from 11 percent four years ago, according to Central Bank figures. He noted that per capita income has risen from $1,200 to $2,000. 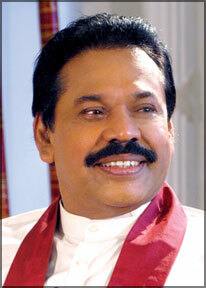 He spoke of his Government’s commitment to economic development and said: “We must have a Sri Lankan model...... I prefer to be agriculturally based. If you can be self-sufficient in food, then the industries will come,” he said. On the question on inquiries into alleged violations of Human Rights during the war, especially its final stages, President Rajapaksa said: “We must not follow what happened in Africa or in Europe. I don’t think it is healthy to start digging into the history, these problems. We must forget about the past and start a new life, new thinking.” Asked whether Sri Lanka does 70 percent of its business with the West, he said “Whoever wants to help me, I will welcome them without strings,” and said “I have invited Americans. New bridges and dams are being done by the British and Canada.” He said he is instituting a Singapore-style “one-stop shop” to limit paperwork and smooth official contacts. “Every Ministry and Department wants to be the king,” the President said. He said he has “zero tolerance on corruption”. “If you give me the evidence, certainly I will take action against anyone,” he said. “I am the man who is closer to the people and who would risk my life for the country. That’s why I won the war, and that’s why I’ll win the economic war, too,” the President said.